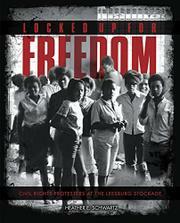 A compelling account of a group of young people who put their freedom and lives at risk as civil rights protesters. In 1963, over 30 African-American girls between the ages of 11 and 16 were arrested for taking part in protests in Americus, Georgia. Unbeknownst to their families, the girls were taken to a Civil War–era stockade in Leesburg, Georgia, where they were confined for weeks in squalid conditions and subjected to inhumane treatment. Schwartz, who interviewed some of the women imprisoned in the stockade, offers a vivid, insightful look at their ordeal. Lack of toilet facilities forced the girls to relieve themselves in their sleeping space, which was nothing more than a stone floor. In addition to overwhelming filth and odor, the stockade was infested with flies, gnats, mosquitoes, and cockroaches. The barely edible food served to them sickened most. They did all they could to support one another and maintain a hopeful spirit, singing freedom songs and praying together. The ordeal makes for gripping reading, but unfortunately it is overwhelmed by the extensive background information on the civil rights movement presented in boxes and on separate pages throughout the account. While the attempt to provide this additional historical context is praiseworthy, it also interrupts the narrative flow and makes it difficult to get a sense of any of the girls as individual characters.